Following the successful completion and launch of the DoubleTree by Hilton hotel, Freighters Eatery & Taproom, and the Baker College Culinary Institute of Michigan, the Saint Clair County commissioned a project to build the 40,000 sq ft convention center. Attached to the Hotel and Restaurant, the Blue Water Convention Center brings a beautiful waterfront view connected to one of Michigan’s major international corridors at the Blue Water Bridge. 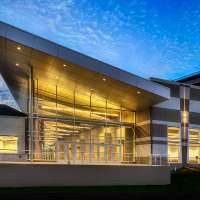 When we decided to create the convention center for St. Clair County we knew choosing Orion Construction was our best option. They have demonstrated strong leadership, careful coordination and genuine care for our community through the thoroughness of their work. The City of Port Huron and St. Clair County will benefit economically from the convention center, but more so, the community is enhanced and energized by this successful completion. We congratulate Orion Construction and the entire team on a job well done.